This multi-purpose facility can simulate a range of environmental conditions that frontline personnel are likely to encounter. These include temperatures from -20 °C to +50 °C and various humidity levels which replicate the majority of environments where Defence personnel are located or may be deployed. By maintaining exact control over the temperature and humidity, human physiological performance in these climatic extremes can be measured, or replicated, using a static test manikin. This allows for the delivery of uniforms and equipment which are designed to meet the needs of the soldier in a variety of environments, by taking into account comfort, performance and integration of combat equipment. The ETF can also be used to test clothing and equipment against chemical or biological hazards, using non-hazardous simulants. This testing is conducted using manikins which can be programmed to perform set movements. 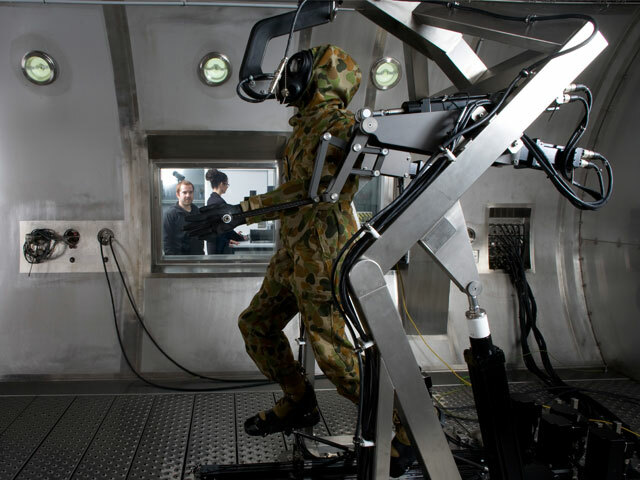 These movements are designed to test the integrity of the protective clothing and to make sure that equipment and clothing integrate together and maintain protection. Data from such tests will support computer modelling that predicts how well Defence forces will operate under certain conditions. It will also allow the development and design of new and improved protection systems to meet the needs of Defence in dealing with changing threats, as well as provide advice regarding the performance and integration of existing equipment.